I'm late with my post today but better late than never. 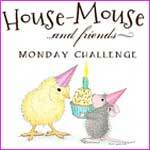 House Mouse & Friends Monday Challenge is here with a new challenge for you. Use a House Mouse, Gruffie or Happy Hopper with flowers or cooking flour... your choice. I have used this super cute 'Lavender Dreams' for my card. mine gave me this beautiful Lavender, I changed my mind. It's diffecult to see but it's a step card. The beautiful Spellbinder die is a new one, 'Floral Ovals' it's called. Flower, pearl and ribbon are from my stash. the paper is from Papermania, I love the colour. They have graciously offered a $10 Gift Certificate to their online store. Just look for this sidebar button and follow the simple steps to upload your new project. Hold op et smukt billede med sommerstemning. Jeg kan godt forstå du valgte at bruge det stempel. Det er jo superflot og sikke farver....og den nye die gør det jo ikke dårligere. Det er en af de dies jeg har fået et behov for også at få..../ købe !!! God aften herfra en lummer, tør og solrig terrasse. Good heavens Dorte, have you got lavender flowering so soon - it's too cold here!!! Your image is delightful, beautifully coloured and such fabulous papers and details!! Beautiful gift combo, one of my favorite HM stamps too. Awesome job. Sikke et dejligt kort og fantastisk motiv du har valgt! Farverne er bare lækre. Dorte, I can smell that beautiful lavender, so nice! Love that you matched your card to the flowers and the heart on the bucket is such a clever idea. Love that oval die, use it so much. Beautiful coloring too. Lovely presentation! Oh so pretty Dorte. Lovely staged pictures too! Love the pretty lavender color as well! So pretty and I love the set up of your photo. Those lavender mice are adorable. Thanks so much for playing along with us in the Flower Power Challenge over on the Simon Says Stamp Challenge Blog! Glad you changed to this. It is beautiful and matches the paper perfectly. The step card provides the perfect showcase for the Lavender Dreams. Love the ribbon. Your card is beautiful Dorte, I think this is one of my favourite House Mouse images and it's a joy to colour isn't it. Your papers and floral oval die cut are perfect and I love your beautiful lavender that your friend gave you - wonderful inspiration. 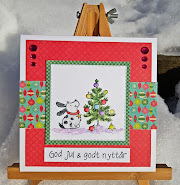 Just popping back to thank you for joining in with our Colour Combo challenge at As You Like It, I love these colours together and you do them so well too! This card looks gorgeous! I love your colouring! Thanks for joining our challenge over at ABC. So pretty - love the colours! Lovely colour combo. I love purple and I love your floral ovals too. Thank you so much for joining in with our favourite colour challenge. Proud to design for As You Like It Challenge.